The Regional Partnership School (RPS) is an educational partnership between Pojoaque Valley Schools (PVS), New Mexico Highlands University (NMHU), and the Laboratory’s Math and Science Academy. Create a model for educational leaders and policy makers. 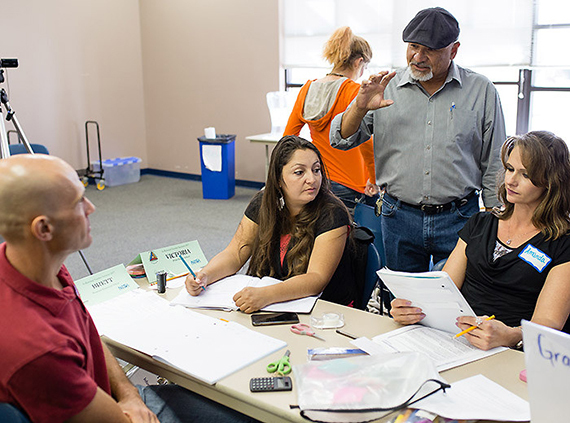 The RPS is something new to New Mexico that integrates previously independent sectors of our educational system to provide a holistic approach to educator development and professional learning. The purpose of the RPS is to work collaboratively to develop a system which integrates coordinated professional development for 4th - 8th grade teachers and incoming teachers from the NMHU school of education to improve student academic performance. The RPS is intended to provide pre-service teachers, in-service teachers, and principals the opportunity to improve their practices. Implementation of the plan started in the 2018-19 school year, with the five-year program following the professional development school approach that has enjoyed success across the country. In this model a school becomes a center of excellence in teacher development in much the same way as a teaching hospital fosters the development of doctors and medical research. It is also intended to be a model of innovation for New Mexico educators and policy makers. The RPS will be the first school in the state to partner strategically with a school district, university pre-service program and a major employer. Through the development of a professional development school that embraces collaboration among K-12, higher education, and a major employer, that is structured around job-embedded professional learning driven by continuous improvement, culturally responsive and evidence-based practices, and transformational leadership, we expect that preservice and in-service teachers engaged in a culture of innovation, will develop evidenced-based practices and significantly improve teaching and learning that will support student achievement.